Cyrillus (Artic Dancer - War Tribute, Lancelot) 1975 black TRR#0086. Sire of G3MSW/CH All Riddles, ROM earner NS Firedrake and producing broodmares. Crops avaliable 1980 to 1997. RD Stop The Music(Quest's Irishman - War Tribute, Lancelot) 1978 dark bay TRR#0090. Another of our TB foundation stallions and half brother to Cyrillus. He has one QH foal (Stop Making Sense) who placed in his only start. Crops 1983 to 1998. Chardonnay (War Flame x Sweety Pie, Summit -r) 1978 chestnut. LS/PS PLACED. Crops 1982-1998. Ventrue [IRE] (Ahonoora -r x Dark Line -m, High Line -r) 1984 light bay. SW Lines all-around. Still waiting for info on first foals to race. Open to US foals foaled 1998-2004, open to Irish foals 1988-1998. 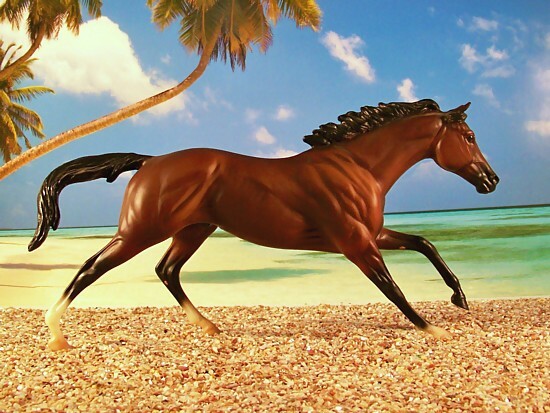 Eternal Prince (Knightmare x Cool Orchid, Cyrillus) 1985 black TRR#0087. Unraced, sire of 11 foals, 3 to race - 1 placed, 1 wnr. Crops 1989-2005. Monarch Twist (Wavering Monarch -r x Mindy's Hurricane -r, Noble Commander) 1988 blood bay. Excellent real lines. Crops 1993-2008. Donovan [IRE] (Le Moss -r x Queens Jewels, Northfields -r) 1990 chestnut. 17(2-5-2-2) MCH/G2MSW. First crop 1996 in USA. Atrocities Of War (Al Nasr [FR] -r x DeLinel, Allegro) 1992 bay. G1MSW, with earnings over $194,523. He is also the half brother to Gallery CH and G1MSW SAMBAL. Crops 1998 and on. Kykuit (Migrant [IRE] x Currency, Little Current) 1992 grey. SW G3Spl, 16(4-3-3-1). First crop 1997. Raven Dance (Shadow Bird x Dream Dance, ACS Riverdance) 1993 black. 2(0-2-0) Spl. Crops 1997 and on. NS War Dance (Cyrillus x War Prize, High Tribute -r) 1993 black. Crops 1997 and on. Vital Spells (Hexce x Vital Dancer, Graustark) 1994 bay TRR#0091. First crop 1998. Crimson Run (BUF Smoky Run x Not Very Nice -r, Secretariat) 1994 bay. LS PLACED. First crop 1998. Whos Afraid (Free Yourself x Fearless Gal, Gallant) 1994 grey. G1Spl 11(0-3-1-2) - PS Winner. Crops 1999 and on. Rachair (Mezair x Rachma, *Dalesman) 1996 black stallion. ONR Registered. *Dark Line [IRE] (High Line -r x Dark Finale -r, Javelot) 1979 bay mare. Miss High Blade (Artic Dancer x Irish Wine, Quest's Irishman) 1980 black mare. Azure Angel (Azure Te -r x Angel Rouge -r, Crimson Satan) 1981 grey mare. Azure Song (Azure Te -r x Crimson Prey -r, Crimson Satan) 1982 chestnut mare. Queen Mary (Cyrillus x Cougar Mary - pending) 1983 black mare. OF SM. Irish Blade (Cyrillus x Azure Blade, Azute Te -r) 1983 black mare. Arctic Blast (Artic Feather -r x My Sierra Leone -r, Relko) 1986 grey mare. Irish Ballad (RD Stop The Music x Irish Flame, Arguement -r) 1992 bay mare. ONR Registered. Firebreeze (Bold Fire x My Sierra Leone -r, Relko) 1993 bay mare. War And Peace (Daugaupils -r x Steel Maiden -r, Damascus) 1993 bay mare. Quick Silver (Porche's Flying Silver x Quicksceneclearance, Cryptoclearance) 1993 grey mare. Crown Royale Ebony (Crown Royale Legato x Dark Star, Essex -r) 1993 black mare TRR#0085. OF Micro Mini. Voulez Vardier (Boule Vardier [FR] x Voulez Vous [FR], Blushing Groom -r) 1994 bay mare. Mai Lage (Turf's Up x Mai [IRE], Caerleon) 1996 bay mare. Race placed. Ravenna (Rackham x Gwyneth Ap Null, Cyrillus) 1996 black mare.